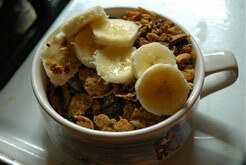 Adding breakfast to your daily eating pattern is a major step towards a healthier lifestyle. How can breakfast help you to be healthier this year? such as obesity, heart disease, diabetes, elevated cholesterol levels, skin problems, bowel cancer, iron deficiency and fatigue. Breaking what for many can be a 7-8hours fast provides growing children and the elderly with up to one-third of their required needs of energy and essential vitamins and minerals for tissue repair and growth. Children that go to school hungry are more likely to be apathetic, inattentive and disruptive. They also suffer reduced levels of concentration, memory and learning processes. Children who are calorie deprived in this way are more likely to withdraw from play, exploration and social interaction. The carbohydrate present in high fibre cereals, fruit and toast can provide energy for ½ to 2hrs. Adding protein and margarine in the form of an egg, cheese or baked beans on toast, or a pottle of yoghurt to fruit and cereal can help to stabilize your energy and blood sugar levels for up to 4-5 hours. If you are serious about sport then breakfast is an essential ingredient to improve performance. While these all seem like valid reasons research has found that feeling sick or nauseous can be made worse when we stop eating. People who skip breakfast are more likely to snack on high fat, high energy snacks later in the day and gain weight than breakfast eaters. Start with small amounts of fruit and cereal with yoghurt. Then add a mid morning snack such as a muffin or piece of fruit or bread. Remember to have a drink such as a cup of tea, glass of milk or water. Parents need to lead by example It is impossible to change the habits of a child if you don’t lead by example. So try toprioritise breakfast eating for the whole family and feel the benefit of better health and a brighter day. Next Eggs – good or bad? Thank you for the good writeup. It in reality was a entertainment account it. Look complicated to more brought agreeable from you! By the way, how can we keep up a correspondence?